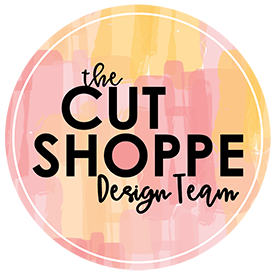 I have a new layout to share with you today that was recently on The Cut Shoppe Blog using The Picture Perfect Cut File! I started with a white cardstock base and then used the Prima Tropicals Watercolor Confections to add color to the background. I positioned the frames from The Picture Perfect Cut File in a grid design on the background. I love how the yellow pops from under the frames! I backed one of the frames with my photo, which happens to be a school photo of my kiddo. I don’t normally scrapbook school photos, but this one had a story that needed to be told! HA! I happened to home on picture day…which doesn’t happen very often since I work full time outside the home. I got Aidan ready for school, sent him off, and when he came home we were talking. I glanced at his shirt and noticed it was on backwards…and it had been that way the ENTIRE day! HA! Thankfully he was wearing a solid color shirt and the stitching from the tag wasn’t very noticeable! We both had a big laugh when we realized what had happened! A lot of the embellishments are from older Amy Tangerine Collections along with a few other odds and ends from my stash. I discuss in my process video at the end of the blog post on how I’m constantly reorganizing my craft supplies & I went through a time period where I made a colossal mistake on opening all of my die cuts and organizing them by color rather than manufacturer. Let’s just say that didn’t work for me! So a majority of the embellishments I use on this layout have been removed from the original packaging so I’m not 100% sure on manufacturer. I’ve since moved on to organizing my embellishments in a way that is more workable for my creative flow. I used retired alpha stickers from Close To My Heart for the title and my We R Memory Keepers Typecast Typewriter to add the journaling. Now you can take a look at my YouTube Process Video. Thank you so much for spending part of your day with me! Remember to head to The Cut Shoppe Etsy Store to check out all of the cut files & digital collections! This blog post contains affiliate links. This means I will receive a commission (at no cost to you) from items that are purchased from those affiliate links. Hey friends! I’m back with a new project that was recently on The Cut Shoppe Blog using the Cuppa Joe Cut File. Today I’m going to be sharing a layout in my Traveler’s Notebook, which is something that is completely new to me! I’m participating in the My Thankful 30 project for the month of November, and I thought the Traveler’s Notebook would be the perfect size to document what I’m thankful for! I started in Cricut Design Space by slicing out one of the coffee cup images from the Cuppa Joe Cut File. I used the contour feature to make the coffee cup a solid image. I then resized the coffee cup to fit onto a Traveler’s Notebook spread. I cut the coffee cup image on a sheet of watercolor paper. I used Shimmerz Paints Jeni B Blue, Heidi Ho Blue, and Lapis Dance to paint the coffee cup while the image was still on the Cricut cutting mat. I grabbed the Maggie Holmes 6×6 Gather Collection Paper Pad and used a blue gingham patterned paper as a layer in my notebook. I used ephemera from the Maggie Holmes Gather Collection and Chasing Dreams Collection as layers behind the photo. I also grabbed a few gold leaves that I picked up at Michaels a few years ago and also tucked a clip, from the One Canoe Two Hazelwood Ephemera Pack, on the right-hand side of the page. For final touches, I added Gold Heidi Swapp Color Shine splatters and a few gold glittery hearts from Close To My Heart. I also added a title using black alphas from my stash and one line of journaling using my We R Memory Keepers Typecast Typewriter. Now you can take a look at my process video that includes a Cricut Design Space tutorial. Remember to head to The Cut Shoppe Etsy Store to check out all of the cut files! Thanks for spending part of your day with me! !